In this lesson students solve an optimization problem based on the real-world example of profit maximization. Students analyze a revenue and profit report for Apple, Inc. to explore profits and profit maximization. They view a video to strengthen their understanding of profits and profit-maximizing behavior. Students use an online graphing tool to plot a quadratic total revenue function. They also analyze the graph of a cubic total cost function. Students then construct a profit function based on a total revenue function and total cost function. Finally, students solve for the optimal quantity of output that would maximize profits based on a given profit function. They determine the appropriate critical value by taking the first derivative of the profit function and then verify that this value yields a maximum by applying a second derivative test to the profit function. Define diminishing marginal returns, marginal cost, marginal revenue, profits (losses), profit maximization, total cost, and total revenue. Graph a quadratic total revenue function based on a firm’s demand function. Build a profit function based on a total revenue function and a total cost function. Determine the maximum of the profit function. Solve an optimization problem to determine the quantity of output that maximizes profit using first and second derivatives of the profit function. Profit: Virtual Economics 4.0 Profit video. Graphing Calculator Activity 1 and 2: one copy for each student. Profit Maximization: an EconEdLink Presentation. Law Of Diminising Returns: Diminishing marginal returns video. 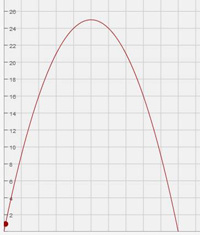 Intelligent Function Graphing Calculator: Online graphing tool. Apple Reports First Quarter Results: Apple's press release. Apple Reports First Quarter Results: pdf file of Apple's press release. What is the definition of profits? Marginal revenues – marginal costs. Total costs – total revenues. If TR = 100Q – 10Q2 and TC = 20Q3 – 50Q2 + 75Q + 1000, what is the profit function? Calculate the level of profits if Q=100 and π = -Q3 + 10Q2 + 25Q – 1000. Suppose Trusty Wheels, Inc., a car dealership wants to maximize its profits. The company faces the following profit function: π(Q) = -Q3 + 75Q2 + 25Q – 100.
Review the goal of this lesson, which was to use calculus to determine the level of output to maximize profits for a business. The primary goal of a business is arguably to maximize its profits. Profit is the net financial gain a business receives from producing and selling a good or service. Profits are calculated as the difference between total revenue (TR) and total cost (TC). Businesses earn a profit (π) when total revenue is greater than total cost. They earn a loss when total revenue is less than total cost, and they break-even when total revenue equals total cost. Profit maximization or loss minimization, if the firm cannot earn a profit, occurs at the level of profit where marginal revenue (MR) equals marginal cost (MC). (Note: an exception occurs if variable costs are greater than marginal revenue, in which case the firm would shut down immediately). Marginal revenue is additional revenue received from selling an additional unit of output and would likely shrink as more output is produced. Marginal cost is the additional cost incurred from producing an additional unit of output and would likely rise as more output is produced. A business can add to its profits by increasing production as long as marginal revenue is greater than marginal cost. Therefore, the quantity of output that maximizes profits is the quantity at which marginal revenue equals marginal cost. If a business would produce output greater than this quantity, marginal revenue would be less than marginal cost, which would diminish its profits. Mathematically, the profit function is constructed as the difference between the total revenue function and the total cost function. Total revenue and total cost can be considered functions of one variable, the quantity of output (Q). Marginal revenue is represented by the slope of the total revenue function; using calculus, the slope – and therefore marginal revenue – is estimated by the first derivative of the total revenue function. Similarly, marginal cost is equal to the slope of the total cost function, which can be estimated as the first derivative of the total cost function. For many businesses, total revenues are a quadratic function based on the selling price (P), which can be expressed as a function of the quantity demanded, and the quantity of output sold. Total costs are often represented as a cubic function because costs typically exhibit the behavior of initially increasing at a decreasing rate and then increasing at an increasing rate. This behavior of total costs is explained by the concept of diminishing marginal returns. As a business increases its production of output by using more of a variable input in combination with a fixed input, initially the marginal cost of production decreases. This happens because the addition of resources used in production initially increases, which effectively causes the production of additional units of output to become less costly per unit of output. At some point, however, the addition of more variable resources adds challenges that make production more difficult, resulting in higher costs per unit of output. In other words, at some point of production, marginal cost increases. The quantity of output that maximizes profits can be determined mathematically by solving an optimization problem using calculus. This is done by taking the first derivative of the profit function, setting it equal to zero, and solving for the quantity of output. To verify that this point occurs at the maximum of the profit function, a second derivative test is done on the profit function. To be a maximum, the second derivative must be less than zero, which indicates that the profit function is concave downward and the point is a relative maximum. This lesson assumes students are familiar with polynomial equations, inflection points, critical values, the quadratic formula, and differentiation. The lesson provides a practical application of mathematics and economics, and it should help students to understand a connection between economics and mathematics. To reinforce students’ understanding of profits, show this video based on the example of orange juice (www.econedlink.org/interactives/index.php?iid=219&type=educator). The video includes embedded questions that can be used for classroom discussion and to check for student understanding. A five-question quiz is available at the end of the video that can be used to review the concept of profits and check for student understanding. Explain that profit maximization is a real-world example of a mathematical optimization problem. A business should try to find the level of output that would lead to the maximum amount of profits. To solve an optimization problem, an objective function – in this case, the profit function – must be defined. The dependent variable in the objective function is the variable to be maximized. The goal of optimization is to determine the value of an independent variable – in this case, quantity – that generates the desired outcome of the objective function – in this case, maximum profits. Display Slide 2 to show a profit function in general form. The profit function is constructed as the difference between a total revenue function, f(Q), and a total cost function, g(Q). Both revenues and costs are functions of quantity, Q. Distribute Activity 1 Graphing Total Revenues to each student. Tell students that they will use an online graphing tool or a graphing calculator to graph the total revenue function, TR = 10Q – Q2. Use an online graphing tool of your choice; one example is: . Display Slide 4 to show an example of a total cost function, TC = 2Q3 – 4Q2 + 4Q + 4. Total costs are often represented as a cubic function because costs typically exhibit the behavior of initially increasing at a decreasing rate and then increasing at an increasing rate. This behavior of total costs is explained by the concept of diminishing marginal returns: as a business increases its production of output by using more of a variable input in combination with a fixed input, initially the marginal cost of production decreases but then increases as more of the variable input is used. Marginal cost is the additional cost incurred from producing an additional unit of output. The initial decline in marginal cost happens because the addition of resources used in production initially increases specialization of those resources and teamwork, which are especially beneficial in production. This effectively causes the production of additional units of output to become less costly per unit of output. At some point, however, the addition of more variable resources adds challenges that make production more difficult, resulting in higher costs per unit of output. In other words, at some point of production, marginal cost increases. Therefore, total costs initially increase at an increasing rate and then increase at a decreasing rate. To reinforce students’ understanding of diminishing marginal returns, show this video: . Explain to students that unless a business should close immediately, profit maximization (or loss minimization if the firm cannot earn a profit) occurs when marginal revenue (MR) equals marginal cost (MC). Marginal revenue is additional revenue received from selling an additional unit of output. Marginal revenue is represented by the slope of the total revenue function; using calculus, the slope – and therefore marginal revenue – is estimated by the first derivative of the total revenue function. Similarly, marginal cost is equal to the slope of the total cost function, which can be estimated as the first derivative of the total cost function. Explain to students that the optimization problem of profit maximization can be solved using calculus. This is done by solving for the maximum of the profit function and determining the quantity of output at that profit level. A maximum is identified by determining (1) the critical value when the first derivative of the profit function is set equal to zero and (2) that the second derivative of the profit function is negative at the critical value. Because businesses cannot produce negative quantities of output, emphasize that the relevant range of output that applies to profit maximization is for quantities greater than or equal to zero (Q ≥ 0). Ask each student to calculate the first derivative of the profit function constructed in Slide 5 and ask students to report their answer. [π’(Q) = ∂π/∂Q = -6Q2 + 6Q + 6] If necessary, review how to take the first derivative of a cubic function. Display Slide 6 and demonstrate how to set the first derivative equal to 0 and solve for Q to determine the critical value. Remind students that the quadratic formula can be used to solve for Q. Since Q ≥ 0, the critical value is Q = 1.618. Ask each student to calculate the profit level associated with the critical value of Q=1.618 and ask students to report their answer [π = 5.09]. The profit level is determined by inserting the critical value into the profit function (π = -2Q3 + 3Q2 + 6Q – 4). As a review, display Slide 7 and demonstrate how to solve for the level of profit using the value of Q determined by the critical value 1.618. [π = 5.09] Point out that the example would be more representative of the real world if Q were measured in thousands, so that the critical value would represent a quantity of 1,618 and the corresponding level of profits would be $5,090. Display Slide 8 to show the graph of the profit function and the critical value and corresponding level of profits. Explain to students that it is important to verify whether the level of profit associated with the critical value is the maximum level of profits. A second derivative test can be used to verify if this point is a maximum. A maximum would exist if the second derivative of the profit function were negative at the critical value. Ask each student to calculate the second derivative of the profit function constructed in Slide 5 and ask students to report their answer [π”(Q) = ∂2π/∂Q2 = -12Q + 6]. If necessary, review how to take a second derivative of a cubic function.